PACIFIC AVENUE DOWNTOWN SANTA CRUZ. January 29,1963. 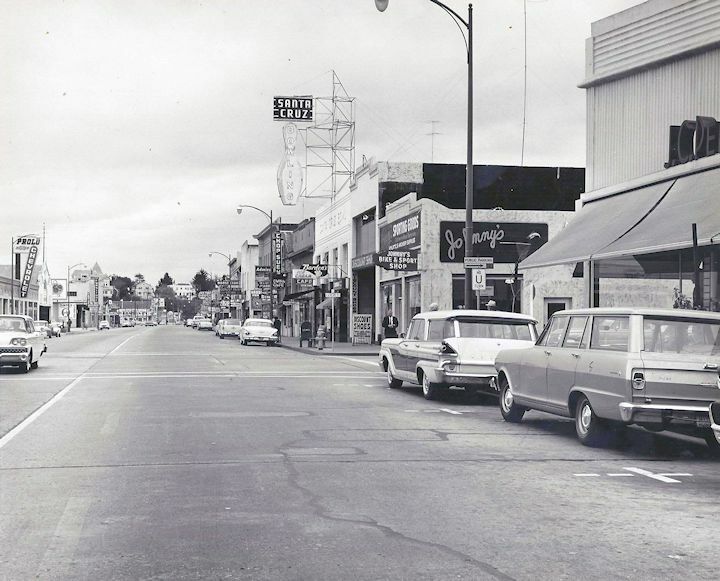 This is Pacific and Cathcart where Old School Shoes is now and where Taqueria Vallarta used to be and Five Guys Burgers is going in. Please note cars parked on BOTH sides of the Avenue, and plenty of room for at least two way traffic. NO STORES HAVE BEEN MOVED SINCE THEN. Now we want to add Parklettes? Restrict it to one way traffic? Somehow these changes are supposed to attract more business? UCSC’S SECRET BUILDING PLANS. Back in the early days UCSC was referred to as “Uncle Charlie’s Summer Camp” now it’s Unfairly Crowded Student Campus or UCSC. Times are really bad even desparate for students attending right now at UCSC. With tuition so sky high and required classes too full to admit the students who need those classes to graduate, many leave without graduating because they can’t afford to stay…and that’s tragic. UCSC administration has doubled and tripled bed space so much that students can’t study in their rooms and try to study in the library…but the library is so crowded there aren’t enough seats. That too is a shame on our State University. Note too that UCSC wants to admit 600 more new students. The admin isn’t sending them to UC Merced, nope – jam them into UCSC !!! With plans to develop the area North of campus with 3 million square feet of buildings UCSC is now mapping, surveying and plotting to develop West Campus, That’s Kresge College, the Porter Cave area, the famed 420 West Meadow (that’ll attract 10-20,000 folks next month on April 20). UCSC is right now boring test holes in Porter Meadow, they are cutting trees, planning to eliminate the age old Trailer Park (long time traditional student dwelling). And the building of Colleges 11 and 12…all on the West side of campus. Right now most of the students aren’t aware of what’s going on. As usual, UCSC Administration will race this development all through the summer when there are fewer students to see the environmental and scholastic changes. BUT other students are aware and we’ll be hearing more from them soon. The largest question is how did California ever start allowing our once great University system to turn into this unfair monster? ABOUT THE CHANCELLOR’S HOUSE. The Chancellor’s House is also known as the University House…and last week I suggested that just maybe since the Chancellor lives over the hill and commutes, that the house could be converted into about 30 student residences. Since then I’ve been informed that… “Effective Nov. 3, 2015 UC Santa Cruz has closed the University House, built in 1967, after determining that the campus will need to make immediate and significant repairs and improvements to have it meet modern standards”. Then it says, “A committee formed this past summer is evaluating the University House to see how it might better meet the needs of the university both as a residence and as a venue for events”. Let’s all guess what that means. By the way, let’s see a show of hands…who remembers the more than $100,000 dog house and dog run that one of the Chancellors had built in the University House backyard?? Slash METRO Service And Spend $100 mil. on Highway 1? Due to declining state support, Metro is facing a $6.5 million per year deficit. A portion of a proposed sales tax measure for the November ballot would reduce that deficit by $2.2 million. That’s not enough to prevent serious cuts in Metro service. Meanwhile the Regional Transportation Commission (RTC) proposes to spend over $100 million in the sales tax measure on widening Highway 1, a downpayment on a larger highway construction project that Caltrans has estimated will have a “very slight improvement in traffic congestion”. The Campaign for Sensible Transportation sent the following letter to the Boards of Metro and the RTC. We believe that the current budgetary crisis at Metro calls for our leaders to step up to the challenge of prioritizing public transit in our County. Thus far, the Metro Board’s response to budgetary constraints is to create a service reduction plan. What we need is a Transit First Policy such as was adopted by the San Francisco Board of Supervisors in 1973. If our community can decide to make public transit a priority, the long-term economic, social, and environmental benefits to our community will be profound. The following are two steps that you can take immediately in your role as elected leaders to prioritize transit and reduce the need for Metro service cuts. 1. Increase Metro’s portion of the transportation sales tax for November, 2016. The 15% of the revenue allocated to Metro is inadequate. It would reduce Metro’s $6.5 million annual deficit by $2.2 million. To gut Metro service at the same time as allocating funds for an ineffectual widening of Highway 1 worsens social inequity in our County. This runs counter to our deeply held community value for social justice. The EIR on the Highway 1 projects estimates that the congestion relief for the proposed TSM Alternative will be “very slight”. The TSM Alternative is a much larger project than the widening project envisioned in the proposed sales tax measure. So there is no credible evidence that the smaller highway project that could be funded by the sales tax measure will have any measurable impact on traffic congestion. 2. Implement a plan for comprehensive Transportation Demand Management that includes free or discounted employee bus passes. For example, UCSC provides bus passes for employees for $10 per month. We urge you to campaign for a similar program at all large employers in the County as well as all businesses in Downtown Santa Cruz where bus passes could be funded by the Downtown Parking District.”. Get in touch with the Campaign and send emails to the RTC. Also note there will be a Metro Board Meeting, Mar 25, 8:30am: Presentation of Metro service reduction plan at the Santa Cruz City Council Chambers. ERRETT CIRCLE. Most of the folks around Walk Circle (aka Errett Circle) are having an issue with the Garfield Park (new name) Church across the street. “The new pastor since mid- to late 2015 is attempting to “clean up” the neighborhood. The Circle neighbors like the neighborhood as it is now. In addition to painting the church, he has installed about 20+ high intensity mercury vapor flood lamps around the perimeter of the building and in the courtyard. These lights are illuminating most of the houses on the circle all night long. They’ve tried to talk to him and he’s been defensive concerning their installation but finally promised he would install shields (12/15/15). The neighbors have sent him mails and letters which go unanswered. Talk around the Circle is that he has no intention of doing anything and thinks we’ll “get used to them” NOT! In desperation, one neighbor reported the situation to city code enforcement, and they responded promptly. He (the pastor) bamboozled them into thinking that he was installing them immediately (2 weeks ago). If you’re in the neighborhood some evening, take a drive and check them out. Almost like having our bedrooms lit up like a football field”. That was almost word for word what one neighbor/friend sent to me this week. Let’s see what happens. I’ll keep you informed. MY NEW iPHONE & APPLE. Never in a million years would I have imagined that the Apple Corporation would be the easiest, nicest, most patient manufacturer I’ve ever dealt with. I’ve now had my Apple iPhone 6 plus for 8 days. It’s my first cell phone. In that week I’ve had two free one-on-one half hour sessions and a free Apple workshop in Los Gatos that lasted 2 and a half hours. It was extra long because of some extra linkage details to Cruzio, my ISP. Cruzio’s Chris Neklason was of enormous help too. iPhones are full of tools, treats, and services I never knew existed…and Apple does an amazing job of making sure you know how to use as much of it as you choose. Imagine Comcast coming to your house (free) and showing you how to use your hookup. Think about a new car dealer giving you free lessons on your new car features, think about any new purchase of a device that was complicated…get any help? I’m just impressed with Apple, that’s all and I’ve scheduled two more sessions this week. More than that, near the end of my Los Gatos workshop session at the Apple Store, in walks Rita Wadsworth so I knew I was still on this earth. SIMPLY BEAUTIFUL (NOT PROFOUND, NOT DEEP OR HEAVY, JUST BEAUTIFUL) PHOTOS FROM MY COUNSIN DEAN. Click here to see a gorgeous slide show of pictures from all over the world. Just returned from 10 day stay in Hawaii. All 10 days on Oahu. Sharon and I used to visit this island at least once a year since 1986 mostly to enjoy the beaches and visit my brother and his family. My, how things have changed, traffic wise, since that first visit. The main freeway artery, the H1, goes from downtown Honolulu to the west side of the island, and in 1986 it was already crammed with cars. Leaping ahead to 2016 there are now long stretches of 10 lanes of H1, and you guessed it, all crammed with cars during rush hour. Want to drive up to the North Shore and see the rest of Oahu? Be prepared for a few hours on the weekend crawling along on a two-lane highway that hasn’t changed much since 1956, my first U.S. Navy duty station in Wahiawa. There have been mitigation measures, like their “zipper lanes” that move a divider into the lanes that are going this opposite way during commute hours. They have under construction a light rail system that will basically parallel the H1. Road beds are built and stations are under construction, but the residents remain skeptical if the rail line will ever be completed due to project slippages. My guess is that it will, and be heavily used. Honolulu has a great bus transit system. You can get to and from the airport on the bus, straight to the hotels. A yearly bus pass for seniors is $30. Many seniors on the staff at the hotel I stay at don’t own cars, eliminating that cost and having to pay for parking. Sounds like something like that should be workable here? (Paul Elerick is a member of, and former co-chair of the Campaign for Sensible Transportation, http://sensibletransportation.org . He’s a current member of Nisene to Sea, a group of mid-county citizens committed to maintaining an open hiking trail from Cabrillo College to Nisene Marks State Park. The comment period for the environmental review of the Santa Cruz Wharf Master Plan ends on April 12th. Not surprising if you are unaware the comment period had even started. Little publicity has been afforded this project, which will result in a distinctly different, made-over wharf. The Mitigated Negative Declaration (MND) is worthy of your careful scrutiny and comment. The city and its consultants are probably hoping you won’t. I admit to a preference for the current wharf in all its funky, fish-stained historical appeal. I understand that others may welcome the upscale, gentrified, design-coordinated makeover. All of us however should be concerned with the omissions and assumptions that underlie much of the MND. The document can be found at: (here) Amidst all the feel good rhetoric and assurances of “no impacts”, “less than significant impacts” or “mitigated significant impact reduced to less than significant” is a troubling omission. The viewing holes for the sea lions are perhaps the biggest draw for visitors. Their delighted exclamations at the first sighting of these protected marine mammals always makes me smile and reflect on how fortunate we are to live here and take such sights for granted. The sea lion viewing holes are gone in the new wharf project. Nor is there any mention of their replacement, either in the MND or the equally long Wharf Master Plan. What we will have at the end of the wharf is a 45 foot-high warehouse-style building to replicate the original building from the early days when the wharf was a commercial fishing enterprise. This is one of three such large buildings proposed. In the words of the consultants: “new civic-spirited buildings are proposed that are punctuations in the built form of the Wharf as well as in the activity pattern to enrich and expand the visitor experience.” page 27 Wharf Master Plan. Each of these three new buildings of 45 feet in height plus architectural projections are said to be in scale with other larger structures such as the Dream Inn. Renditions of the new buildings are taken from a birds-eye view so you cannot see how much view-shed will be lost from the wharf although the documents assure us there will be plenty left to see. The first two elements of the plan to be built will be moving the kiosks further down the wharf about 500 feet south and the construction of an Eastern Promenade which requires an additional 500 pilings to be pounded 30 feet into the sea floor. The placement of the new kiosks is probably a sound idea but there are troubling aspects. This will be a pay-on-foot automated system, requiring 12 pay stations, a parking office and a new “demand pricing strategy”(whatever that means) plus new, metal pilings under the wharf. This system sounds decidedly unfriendly to the elderly who have supported the wharf restaurants such as Gilda’s for decades. I for one will fight to retain the wonderful women and men who currently staff the kiosks. Such human issues of course are irrelevant to a MND. What is relevant to the MND is the disconnect between the aim of the project, which is stated as economic growth and increased visitor access and the provision of adequate parking. There are currently 440 parking spaces on the Wharf. No additional parking is planned for, although new striping (read, narrower spaces) may yield an extra 40 spaces. Despite the fact that the project aims for an increase of businesses from the current 19 to 35-40, encourages second stories for all businesses, with a wide promenade on the east and a lowered walkway on the westside to encourage more access, when it comes to discussing how much the visitation to the Wharf will increase due to this project, the language becomes coy. All of this “could” increase the numbers of visitors states the MND, but it remains mute on predictions. Therefore it concludes that, “future construction would not result in significant traffic or parking impacts” because such impacts will be mitigated by the provision of 65 bicycle parking spots. This, despite the entry stating that, “parking is considered by most of the (Wharf) tenants to be the most essential element to their business success.” Page 35 Wharf Master Plan. There is much more in the MND to critique. Next week’s column will continue. Lots of things are happening this week in the City of Santa Cruz! MARIA CALLAS 1965. She sings Puccini. HOW WHALES CHANGE CLIMATE. Just a bit of supercilious Brit. attitude but interesting. I think this means that the currently somewhat complex traffic patterns downtown would be modified to allow Pacific Avenue to serve as a thoroughfare for people wanting to get to the Beach Boardwalk. That’s what “finding your way South” actually means, as far as I can tell. Some people want a total pedestrian experience. You can weigh in if you show up! Gary continues…” Here is another meeting coming up on the Santa Cruz downtown! On Monday 3/21, the City’s Transportation and Public Works Commission considered a proposal to alter traffic patterns in downtown Santa Cruz. Current traffic patterns are designed to prevent cars from using Pacific Avenue as a thoroughfare to get to the Beach. If you have a car, and if you are in the downtown area, and if you want to get to the Beach, the best way to do that now is to use either Front Street or Chestnut, and Front Street is really the most direct route. This could change, and Pacific Avenue could become a more direct route out to the Beach Boardwalk. I’ll keep you posted. Meantime, if you have any preference about this, it’s time to start getting involved. One way to get involved would be to attend tomorrow’s meeting of the Santa Cruz Downtown Commission, and to let the Commission know what you think. The Commission will meet on Thursday morning, March 24th, at 8:30 a.m. in the City Council Chambers. There are links to more information at kusp.org/landuse. Besides hearing from the public under its “Oral Communications” item, the Downtown Commission will be reviewing the City’s Capital Improvement Program for 2016-2018. The infrastructure investments proposed for the next couple of years will have a big impact on City residents, you can be sure of that! MARIA CALLAS TALKS ABOUT JACKIE KENNEDY AND ARISTOTLE O. Note how she wears her hair long like in the Master Class play. CLASSICAL DeCINZO. DeCinzo, an experienced Cuba traveler gives us a sneak preview of recent policy changes. Scroll down just a bit. EAGAN’S DEEP COVER. 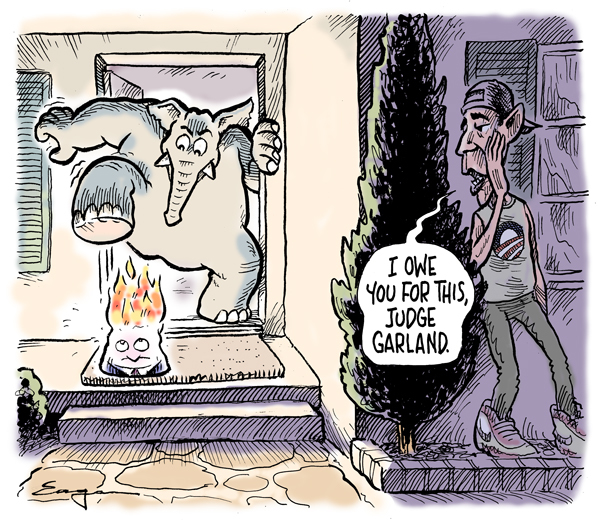 One step forward for Garland sez Eagan…see below a few pages. MAH PRESENTS THE KINSEY COLLECTION OF AFRICAN AMERICAN ART & HIISTORY. Spanning 400 years of history, the Kinsey Collection reflects a rich cultural heritage. Includes work by Romare Bearden, Elizabeth Catlett, Jacob Lawrence, and Richard Mayhew alongside archival material related to Frederick Douglass, Zora Neale Hurston, and Malcolm X. The MAH is providing free admission to this exhibition for all Santa Cruz County K-12 students, UCSC and Cabrillo College students. Just show your ID at the desk Feb 27-May 22, Tuesday-Sunday, 11-5, to get in for free. Note: Free Admission does not apply during Third Friday festivals. SANTA CRUZ BAROQUE FESTIVAL.The Festival presents their fifth concert in this season…FIVE FANTASTIC FLUTES. They say, “Come get your Louis the 15th on! Boismortier was the first composer in history to write for the unique combination of five solo baroque flutes. The program also includes the popular London Trios by Joseph Haydn written in 1794. This performance features the entire flute section of the Philharmonia Baroque Orchestra – Stephen Schultz, Janet See and Mindy Rosenfeld – joined by Bay Area flutists Lars Johannesson and Alissa Roedig, with Amy Brodo on cello. Sunday April 3 at 4:00pm Holy Cross Church , 210 High Street, Santa Cruz. Tickets probably/maybe at the door or call 831-457-9693, E-mail info@scbaroque.org, P.O. Box 482, Santa Cruz, CA 95061. LISA JENSEN LINKS. Lisa writes: “Coming this summer: Alias Hook makes its stage debut in an original production by Santa Cruz Parks & Recreation Teen Theatre! Read all the details this week at Lisa Jensen Online Express (http://ljo-express.blogspot.com).” Lisa has been writing film reviews and columns for Good Times since 1975. THE REVENANT. What’s odd about The Revenant is that hardly anyone I know, knew what the word meant. Looking it up (I had to) in Wictionary you’ll find… Someone who returns from a long absence. A person or thing reborn. A supernatural being that returns from the dead; a zombie or ghost. The film is a Big Golden Globes and Oscar winner for best Drama film and for Leonardo DiCaprio’s best acting and Alejandro Inarritu for best Director. Set in the 1820’s its about Leonardo and his fellow fur trappers being attacked or occasionally helped by Indian tribes such as the Ree, the Ankara,the Pawnee and the Sioux. DeCaprio almost dies from a bear attack and spends the rest of the film crawling and freezing his way to revenge the trappers who left him to die. DeCaprio has only 15 lines in English, he takes off his clothes and sleeps inside a dead horse (after removing the guts) and then he wins the Golden Globes and the OSCAR !!! Go figure, but you do need to see it on a big screen. This is perhaps one of my guilty pleasures… clips from the various “got talent” shows. I never watch whole episodes, and I don’t like the bad ones that make you cringe, but when someone comes on and out of left field blows everyone away – I love that. This is a good example.